The goal of the OHADAC project is twofold: (i) promoting legislative harmonisation by proposing to States model legislation in the field of business law and (ii) promoting arbitration and mediation in the Caribbean region, through the opening of an arbitration centre, the OHADAC Regional Centre for Arbitration. The objective of the OHADAC Regional Centre for Arbitration will be to provide efficient and cost­-effective procedural solutions to all types of disputes involving individuals, companies and States in the Caribbean, at both the domestic and international level, while addressing the constraints of the Caribbean business environment and other specific regional difficulties. 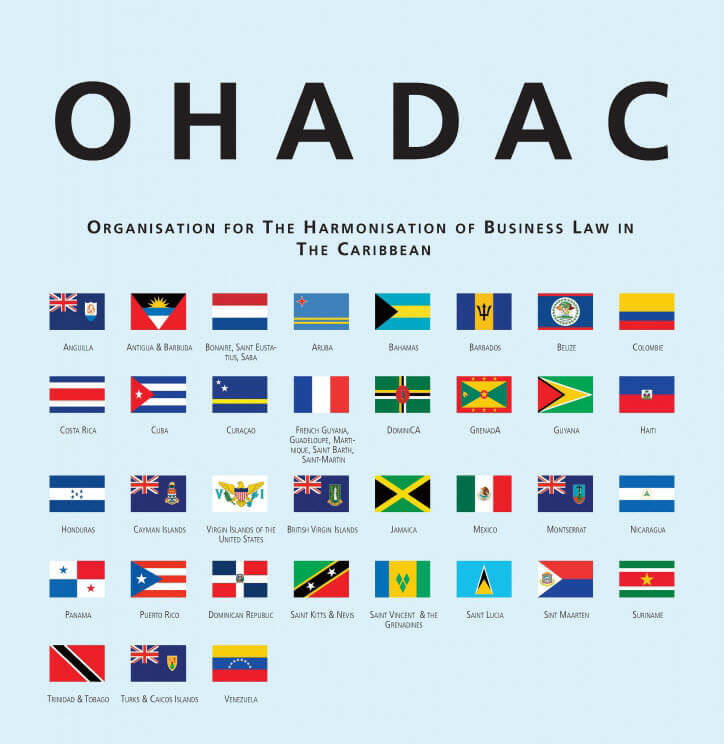 The OHADAC project, which name stands for “Organization for the Harmonization of Business Law in the Caribbean,” was initiated in 2007 by the Chamber of Commerce and Industry of Pointe-à-Pitre, with the support of the European Union, France, the Guadeloupe, Martinique and Guyane territories, as well as employers’ associations such as the MEDEF and the CGPME. Based on the successful OHADA model in Western Africa, the purpose of the OHADAC project is to advance legal and judicial integration of the Caribbean in order to ensure that a harmonised legal framework applies to the activities of Caribbean businesses. It involves 33 States, extending to all of the Caribbean Island States but also coastal regions including Mexico, Venezuela, Colombia and Costa Rica. In this context, the OHADAC team was invited to the Second Inter-Sessional Regional Meeting of the UNCITRAL Working Group on Investor-State Dispute Settlement Reform, which took place in Santo Domingo on 13 and 14 February 2019 (see the program here). UNCITRAL has been following the work of OHADAC for several years. Representatives of UNCITRAL had already pointed out at the 2015 Pointe-à-Pitre Congress the importance of legal harmonisation work at a regional level, which was carried out during the first phase of the project thanks to the help of Europe and Interreg. This event brought together representatives of UNCITRAL Member States, including a significant number of Caribbean States, such as Belize, Venezuela, Colombia, Jamaica, Costa Rica, Bahamas, Mexico, Ecuador and the Dominican Republic. Representatives of the regional organisations SELA and CARICOM were also present at this event, as well as Investment Arbitration law experts from around the world. These two days provided States’ representatives with an opportunity to express their views on the challenges being faced in the field of Investment Arbitration, which allows for the settlement of disputes between investors and States on the basis of texts protecting foreign investments. An important source of the international protection of foreign investments lies in bilateral investment treaties, commonly known as BIT’s. These treaties guarantee certain protections to foreign investors, the main standards being the prohibition of expropriation; discrimination; unfair and inequitable treatment; and denial of justice. The State is always Respondent in the context of these proceedings, the possibility of introducing counterclaims being limited. The main criticisms addressed to the framework of investment arbitration as it stands today relate to the cost and length of the proceedings; the lack of an expeditious procedure allowing prompt termination of claims against States that are manifestly abusive or that lacks serious grounds; the insufficient diversity of arbitrators’ panels; but also the lack of coherence between decisions rendered which is a factor of uncertainty. State representatives were able to discuss the content of “new generation” investment treaties more protective of their interests, as well as solutions developed internally to overcome some of the shortcomings of the current system. Finally, these two days of meetings were also the opportunity for brainstorming and the formulation of new proposals. OHADAC representatives were able to intervene and highlight the relevance of harmonisation in this context. The law of foreign investment protection stems from very different sources in the Caribbean, and standards of protection are very unequal. In addition, the contents of these standards of investment protection are not always precisely defined. In this field, codification would be welcome, encompassing a clarification of the sources of foreign investment protection in the Caribbean and the different levels of foreign investment protection by country. A model treaty of investment protection would also be proposed, providing States and investors with sufficient guarantees on both procedural and substantive levels. It was mentioned that OHADAC could start work in this direction, and set up a working group bringing together experts and a number of Caribbean States’ representatives who have already expressed interest in the initiative. For more information, Marie-Camille PITTON can be contacted.